​Day 40. 42 Traverse – Ketetahi Carpark. 34km. Total 1118km. I am starting the day at 6am while the Canadians seem still asleep. It’s a bit misty in the morning and pretty cold. The hike continues as yesterday on this easy to walk on road, although it’s now longer stretches going up and then very steep down into my first river crossing today. I can’t stand wet feet so I take off my shoes and walk barefoot through the water. Oh gosh, it’s freezing cold and makes my feet hurt. But quickly I am on the other side and put back my shoes on and already have a snack, it’s not even 9am but my backpack is so heavy I need to eat and try to make it lighter. 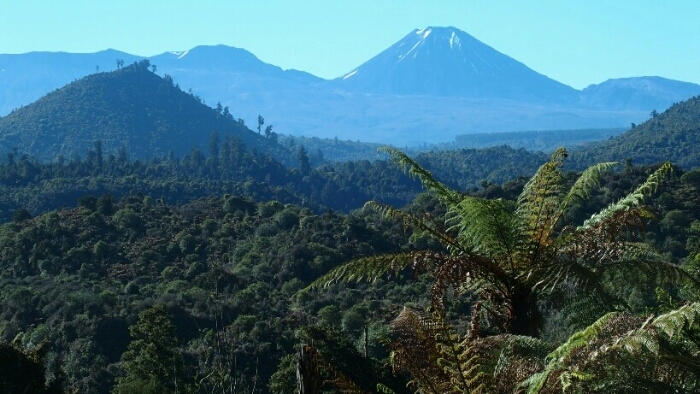 There are a few nice viewpoints along the way, down to the river but then also of Tongariro, Ngauruhoe and Ruapehu! How close they are now! Ngauruhoe has not much snow left, so I can totally make the summit I guess (just a little problem: my pack weight). I leave the 42 Traverse for the Waione – Cookers trail which is more difficult now to walk on and steeper. More river crossings! Even a very big one, at first sight it looks not too bad although where the trail seems to continue there is some water flowing. So I walk barefoot only to realise that it’s another river coming in, not the trail. I need to check my GPS with my shoes and socks and hiking poles in my hand. Seems to be that direction so I follow the river. My feet hurt because of the cold water and the stones. Then I can see the next, much bigger river and the trail at the other side. Luckily there is a spot where I can put my shoes on to cross the stream safely. Well that’s it with dry shoes! Time for another break and more food and a water refill before continuing. I listen to my Spanish lessons and music and hike and hike until I make it out of the trail onto a short road walk before heading back into the bush again. This is amazing, the dry landscape with the yellow blooming plants and Ngauruhoe, Tongariro and Ruapehu in the background. Wow, this is amazing. I find a perfect spot with view for my lunch – although there is no shadow. It’s a short hike then to the highway and the holiday Park which I reach around 2.30pm. I am unsure what to do. I want to continue to the start of the Tongariro Alpine crossing (or end as everyone except Te Araroa hikers are doing it in the other direction) but the water from the rivers there is not drinkable due to the volcanic activity. But if I stay here the day tomorrow will be far too long with 8km road, 6-8h Tongariro alpine crossing, 3h for Ngauruhoe summit (which is optional but I want to go to the famous Lord of the Rings summit), 4-5h then to the Whakapapa Village. The hut on the way was fully booked so I can’t stop earlier. A shuttle bus driver tells me I can camp somewhere at the start but need to bring water. Robin is suddenly calling my name. I join him and Chloé in the holiday park and have a break, drink plenty of water and tea and we exchange our latest stories and plans. I fill up all bottles with 5l of water and start hiking again around 4pm just when the two Canadians arrive. I can now barely lift my pack but I just do it anyway. Not even 2h later I am at the Ketetahi Carpark where plenty of people come out of the crossing, happy to have made it. The problem is a sign that camping is not allowed. Maybe I can just continue and sleep in the bush? But first it’s time for dinner and some stretching. I ask a couple doing some acro-yoga and they say they already camped here in their car and will stay as well, I should just wait for sunset before setting up my tent. OK, now I have time to write my blog. At 8pm people are still coming out of the trail, the later it gets the more exhausted the people seem to be. It’s now getting cold so I need to set up my tent. Also I need to start very early tomorrow! Previous Post Waihaha hut to 42 Traverse. More trail magic and great days. Next Post Ketetahi Carpark – Whakapapa Village. One of the highlights so far, the Tongariro crossing!